There is much to be admired about La Candelaria. Amidst the winding alleys of Bogota’s oldest district, Latin American charm and European sophistication intermingle effortlessly. Those searching for artistic inspiration or a bowl of ajiaco (chicken and potato soup) needn’t look far. To the south, the cobbled streets sits the stately Plaza Bolivar and to the North the Botero museum, home to the famously corpulent portraits of Colombia’s most renowned artists. Yet inspiration here is not solely confined to grandiose architecture or even a stretch of canvas. For those who book a free tour, or stop to examine the graffiti interspersed throughout the district, a poignant rhetoric is revealed. 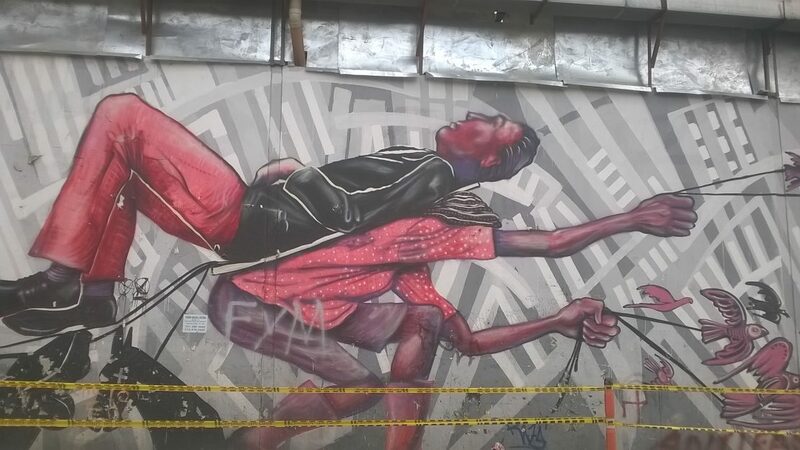 The struggles of elements of Colombian society all too often overlooked amidst the bustling of the capital are elegantly narrated by the murales. 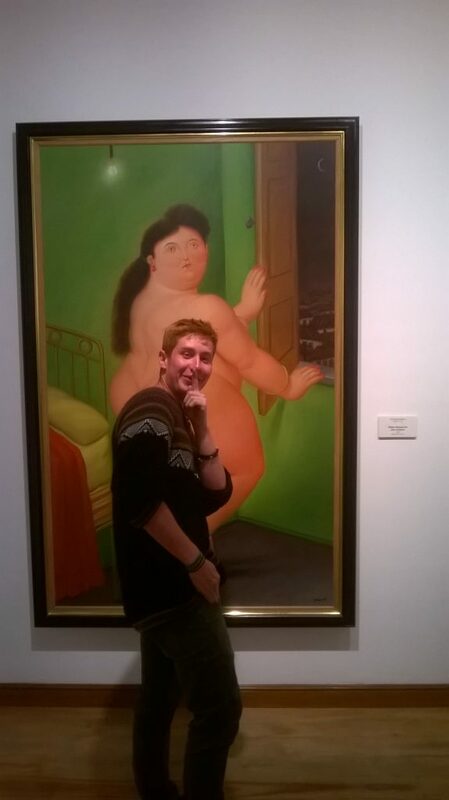 Some art of the, erm, more conventional kind in the Botero museum. In 2011, young graffiti artist Diego Felipe Becerra left home one evening and never returned. He was gunned down by police whilst painting his signature image, a wide eyed cat. Officers sedulously portrayed him as a robber before the truth was uncovered. The resulting outcry reached those in the highest echelons of government and sparked the legalisation of street art. 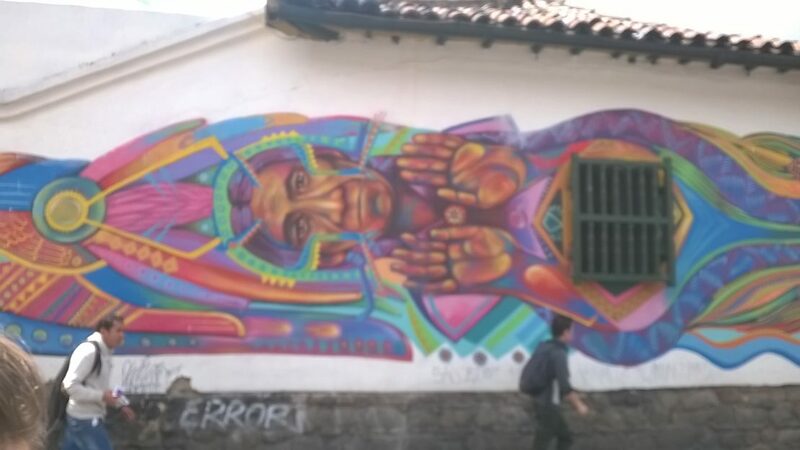 In response Gustavo Petro, Bogota’s mayor, demarcated hundreds of spots in La Candelaria and throughout the city where artists could paint without harassment. Invariably, those granted the freedom of expression began to champion groups still oppressed. 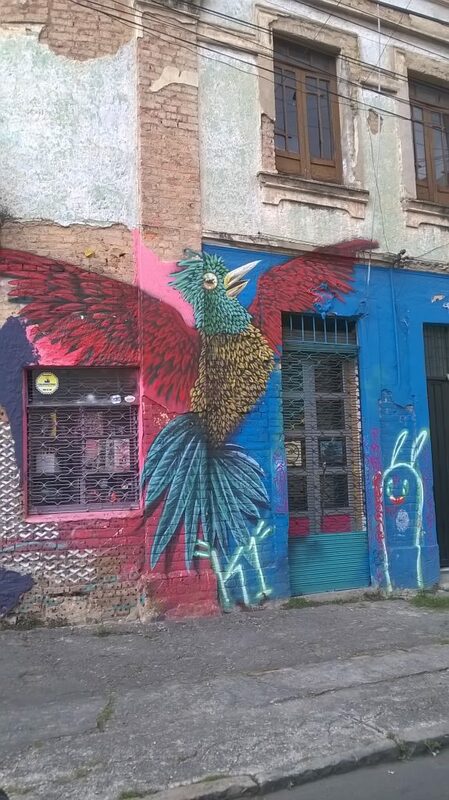 Today, taking a graffiti tour is one of the best free things to do in Bogota. Some artists also produce stencils. They can be placed on a wall and drawn over in a matter of seconds. Their expediency means that they feature prolifically throughout the city. 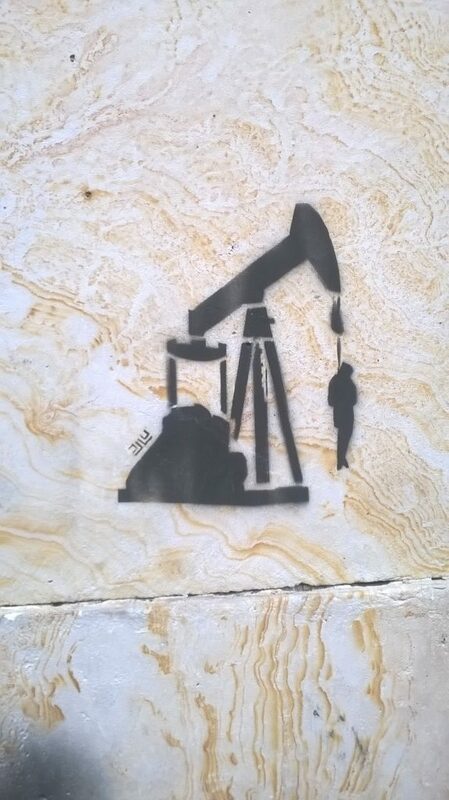 This particular image alludes strongly to the ruthlessness of the oil industry. La Candelaria is blemished by incomprehensible tags as much as it is adorned by meticulously planned murales. These scrawls can be accomplished in 30 seconds with a marker pen or can of spray paint. They are found in any city and are as ubiquitous as they are unremarkable. There is the temptation to view these as inconveniences, marring the authenticity of murals and the surrounding architecture. Tags and murals, however, are intrinsically connected. Without them, there would be no art tour in La Candelaria. For many budding graffiti artists, tags are a fundamental way of establishing an identity for themselves. They frequently tag in order to spread their name, before refining their technique and later producing more complex murales. The murales in question are breathtaking; they seem to leap out of the drab walls. A hummingbird spreads its wings majestically whilst a luminescent green chameleon dwells on a wall. All these animals are native to the rainforests of Colombia. In unison, we raise our cameras and begin to eagerly snap photos. After the initial frenetic burst of photography, people begin taking less and simply stare at the murals thoughtfully. Internally, I begin questioning the graffiti artists motives. 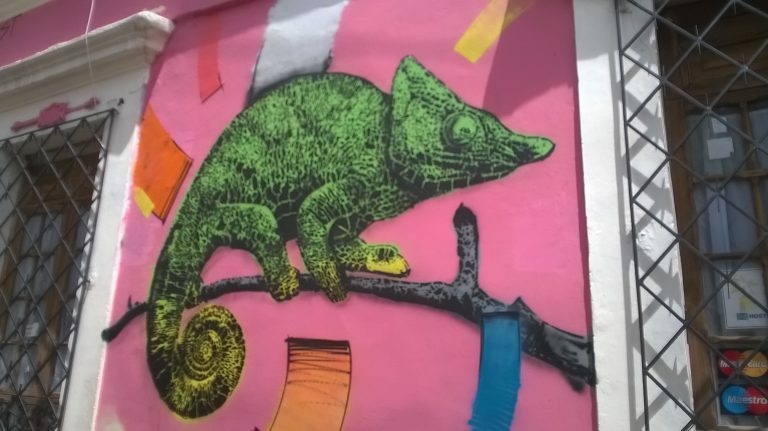 Why place this artwork here in La Candelaria? Having lived in a city all of my life, I understand how weeks can subside without me encountering the slightest hint of nature. Was the intention of the artists to pull people of their daily lives briefly, or did these murals harbour a more complex agenda? There are definite advantages to taking an art tour. As we walk I am able to quiz my guide on the murales. He tells me that Colombia is amongst the most ecologically varied countries on the planet. It is also rich in raw materials and resources. Rather than being celebrated, this diversity is often exploited. Between 1986-90, under president Virgilo Barco Vargas approximately 2.2% of Colombia’s rainforest was harvested every year between. Although deforestation has slowed in recent years, the country still loses 2000 square kilometres annually. The main perpetrators are logging, mining and palm oil companies. Naturally the flora and fauna who are deprived of their habitat are amongst the first, but not the only ones to suffer. 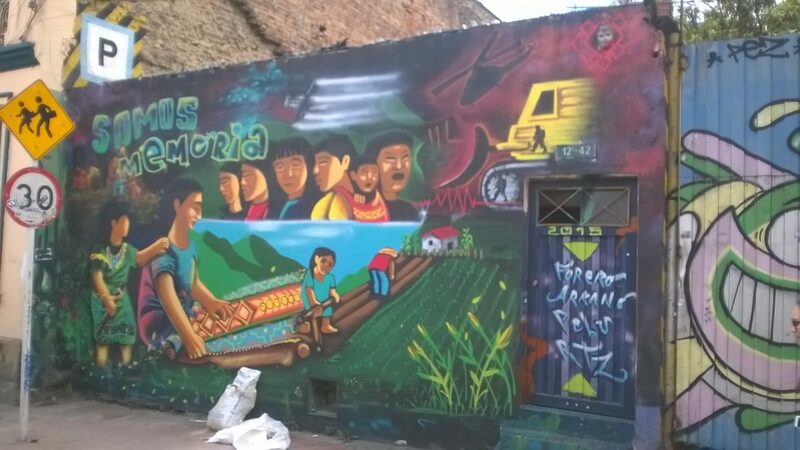 As we step out of La Candelaria, the murales begin to change. The majority now depict people of indigenous heritage, a demographic representing 3.4% of Colombia’s population. Around 70 groups of indigenous people live in Colombia’s Amazon basin. They are thinly spread in this vast region yet represent a crucial but tenuous link to the past, with their own unique languages and traditions. The majority subsistence farm to survive, growing and consuming their own maize. One picture highlights the delicate beauty of their garments. A man’s headdress is formed with intricate, colourful swirls. His expression, however, is sombre, his hands held out empty in front of him. A plea or simply a gesture born of hopelessness and malaise? A few houses down, a more sinister scene unfolds in a mural. A bulldozer looms over a field of maize whilst a family turns away, their features writ with sorrow. Innumerable conflicts taking place over the last half- century have driven dozens of tribes from their homes. When not being deprived of their homes under the injustices of conflict, the indigenous population face pressure and hostility from companies looking to mine for minerals or export palm oil. So far, there has been very little recourse for justice. Perhaps the most memorable mural of all is saved for the end of the art tour. It occupies the entire side of a building. It depicts a man, carrying another on his back. Attached to his hands by strings are numerous small birds, flapping in vain. Our guide explains the significance of the mural. In mountainous regions during the previous century, it was commonplace for the rich to pay others less fortunate to transport them. They used the only means available, themselves. We can see everything of the man except his face. His pained stance is evocative of a life of servitude and is sharply juxtaposed by the look of blank indifference of his passengers face. I don’t even enquire about the birds, I know what captivity looks like when I see it. I depart from the tour with a range of emotions. I have been astounded by the beauty and intricacy of the graffiti and had never before been privy to the complexity of motives behind street art. But although gloriously constructed, many of the murals address contentious issues. I sit in a bar in La Candelaria disconsolately swigging my beer. Hearing so much about the exploitation of resources, at the detriment of an ethnic group and the environment was desperately saddening. I try to find positives to take away from this as I idly flick through the pictures I have taken. In the end I conclude that the mere presence of the art was heartening. As people went about their daily lives, they would be exposed to these issues through the rhetoric created by these images. As Colombia’s civil war nears an end, it will be harder for the displacement of the indigenous population and the destruction of their environment to go unnoticed, certainly a positive thing for inhabitants of the Sierra Nevada. Yet with this shift in policy comes a new set of challenges. The country will have to balance economic advancement with the preservation of its natural resources. Never again will the indigenous population have to carry the rich upon their backs, the discrimination facing them now will be far more subtle. It will masquerade under the guise of growth for the country at the expense of the welfare of ethnic group and endangered species. I fervently hope that Bogota’s artistic community keep painting on walls. A shift in attitude can sometimes be imperceptible, but can make an overwhelming difference. Grafitti tours In Bogota run twice a day between 10- 12:30 am and 2-4:30p.m. They begin in La Candelaria and there are English, Spanish and German speaking options. Participation is free, with people giving a donation at the end based on what they think the tour was worth. To find out more follow the link below.